With reference to the whaling scene shortly to be described, as well as for the better understanding of all similar scenes elsewhere presented, I have here to speak of the magical, sometimes horrible whale-line. The line originally used in the fishery was of the best hemp, slightly vapored with tar, not impregnated with it, as in the case of ordinary ropes; for while tar, as ordinarily used, makes the hemp more pliable to the rope-maker, and also renders the rope itself more convenient to the sailor for common ship use; yet, not only would the ordinary quantity too much stiffen the whale-line for the close coiling to which it must be subjected; but as most seamen are beginning to learn, tar in general by no means adds to the rope's durability or strength, however much it may give it compactness and gloss. Of late years the Manilla rope has in the American fishery almost entirely superseded hemp as a material for whale-lines; for, though not so durable as hemp, it is stronger, and far more soft and elastic; and I will add (since there is an aesthetics in all things), is much more handsome and becoming to the boat, than hemp. Hemp is a dusky, dark fellow, a sort of Indian; but Manilla is as a golden-haired Circassian to behold. The whale-line is only two thirds of an inch in thickness. At first sight, you would not think it so strong as it really is. By experiment its one and fifty yarns will each suspend a weight of one hundred and twenty pounds; so that the whole rope will bear a strain nearly equal to three tons. In length, the common sperm whale-line measures something over two hundred fathoms. Towards the stern of the boat it is spirally coiled away in the tub, not like the worm-pipe of a still though, but so as to form one round, cheese-shaped mass of densely bedded "sheaves," or layers of concentric spiralizations, without any hollow but the "heart," or minute vertical tube formed at the axis of the cheese. As the least tangle or kink in the coiling would, in running out, infallibly take somebody's arm, leg, or entire body off, the utmost precaution is used in stowing the line in its tub. Some harpooneers will consume almost an entire morning in this business, carrying the line high aloft and then reeving it downwards through a block towards the tub, so as in the act of coiling to free it from all possible wrinkles and twists. In the English boats two tubs are used instead of one; the same line being continuously coiled in both tubs. There is some advantage in this; because these twin-tubs being so small they fit more readily into the boat, and do not strain it so much; whereas, the American tub, nearly three feet in diameter and of proportionate depth, makes a rather bulky freight for a craft whose planks are but one-half inch in thickness; for the bottom of the whale-boat is like critical ice, which will bear up a considerable distributed weight, but not very much of a concentrated one. When the painted canvas cover is clapped on the American tubline, the boat looks as if it were pulling off with a prodigious great wedding-cake to present to the whales. Both ends of the line are exposed; the lower end terminating in an eye-splice or loop coming up from the bottom against the side of the tub, and hanging over its edge completely disengaged from everything. This arrangement of the lower end is necessary on two accounts. First: In order to facilitate the fastening to it of an additional line from a neighboring boat, in case the stricken whale should sound so deep as to threaten to carry off the entire line originally attached to the harpoon. In these instances, the whale of course is shifted like a mug of ale, as it were, from the one boat to the other; though the first boat always hovers at hand to assist its consort. Second: This arrangement is indispensable for common safety's sake; for were the lower end of the line in any way attached to the boat, and were the whale then to run the line out to the end almost in a single, smoking minute as he sometimes does, he would not stop there, for the doomed boat would infallibly be dragged down after him into the profundity of the sea; and in that case no town-crier would ever find her again. 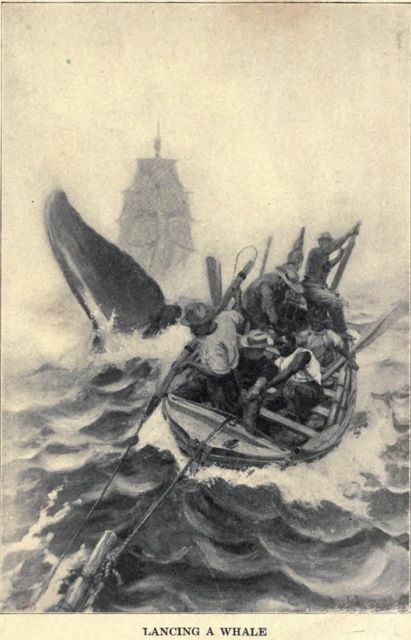 Before lowering the boat for the chase, the upper end of the line is taken aft from the tub, and passing round the loggerhead there, is again carried forward the entire length of the boat, resting crosswise upon the loom or handle of every man's oar, so that it jogs against his wrist in rowing; and also passing between the men, as they alternately sit at the opposite gunwales, to the leaded chocks or grooves in the extreme pointed prow of the boat, where a wooden pin or skewer the size of a common squill, prevents it from slipping out. From the chocks it hangs in a slight festoon over the bows, and is then passed inside the boat again; and some ten or twenty fathoms (called box-line) being coiled upon the box in the bows, it continues its way to the gunwale still a little further aft, and is then attached to the short-warp- the rope which is immediately connected with the harpoon; but previous to that connexion, the short-warp goes through sundry mystifications too tedious to detail. Thus the whale-line folds the whole boat in its complicated coils, twisting and writhing around it in almost every direction. All the oarsmen are involved in its perilous contortions; so that to the timid eye of the landsman, they seem as Indian jugglers, with the deadliest snakes sportively festooning their limbs. Nor can any son of mortal woman, for the first time, seat himself amid those hempen intricacies, and while straining his utmost at the oar, bethink him that at any unknown instant the harpoon may be darted, and all these horrible contortions be put in play like ringed lightnings; he cannot be thus circumstanced without a shudder that makes the very marrow in his bones to quiver in him like a shaken jelly. Yet habit- strange thing! what cannot habit accomplish?- Gayer sallies, more merry mirth, better jokes, and brighter repartees, you never heard over your mahogany, than you will hear over the half-inch white cedar of the whaleboat, when thus hung in hangman's nooses; and, like the six burghers of Calais before King Edward, the six men composing the crew pull into the jaws of death, with a halter around every neck, as you may say. Perhaps a very little thought will now enable you to account for those repeated whaling disasters- some few of which are casually chronicled- of this man or that man being taken out of the boat by the line, and lost. For, when the line is darting out, to be seated then in the boat, is like being seated in the midst of the manifold whizzings of a steam-engine in full play, when every flying beam, and shaft, and wheel, is grazing you. It is worse; for you cannot sit motionless in the heart of these perils, because the boat is rocking like a cradle, and you are pitched one way and the other, without the slightest warning; and only by a certain self-adjusting buoyancy and simultaneousness of volition and action, can you escape being made a Mazeppa of, and run away with where the all-seeing sun himself could never pierce you out. Again: as the profound calm which only apparently precedes and prophesies of the storm, is perhaps more awful than the storm itself; for, indeed, the calm is but the wrapper and envelope of the storm; and contains it in itself, as the seemingly harmless rifle holds the fatal powder, and the ball, and the explosion; so the graceful repose of the line, as it silently serpentines about the oarsmen before being brought into actual play- this is a thing which carries more of true terror than any other aspect of this dangerous affair. But why say more? All men live enveloped in whale-lines. All are born with halters round their necks; but it is only when caught in the swift, sudden turn of death, that mortals realize the silent, subtle, everpresent perils of life. And if you be a philosopher, though seated in the whale-boat, you would not at heart feel one whit more of terror, than though seated before your evening fire with a poker, and not a harpoon, by your side.